I took a poll on my Facebook page yesterday. I was curious about what people preferred, sweet or salty. My husband is salty & I am definitely sweet, but the truth is I love the two mixed together the best. One of my weaknesses is for chocolate covered pretzels. 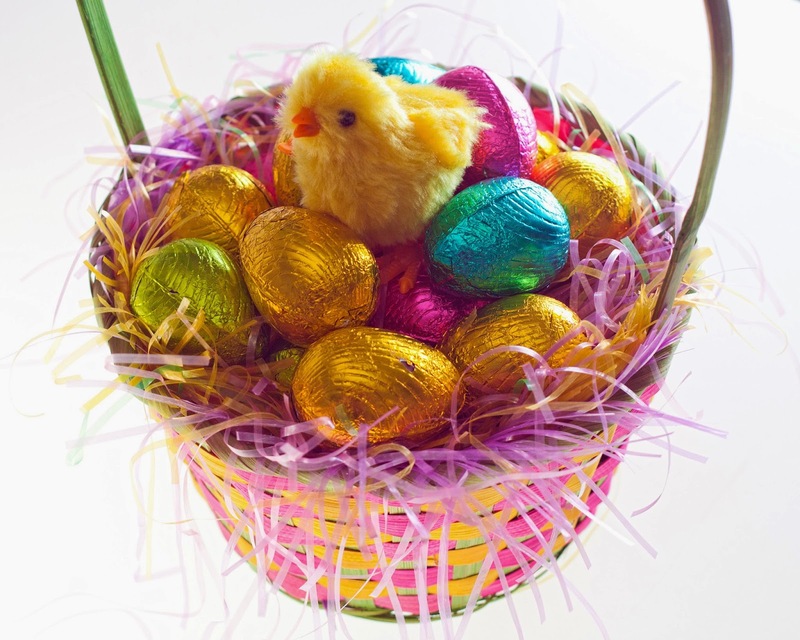 With only one week left before Easter, I have a few more days of Easter inspired fun. 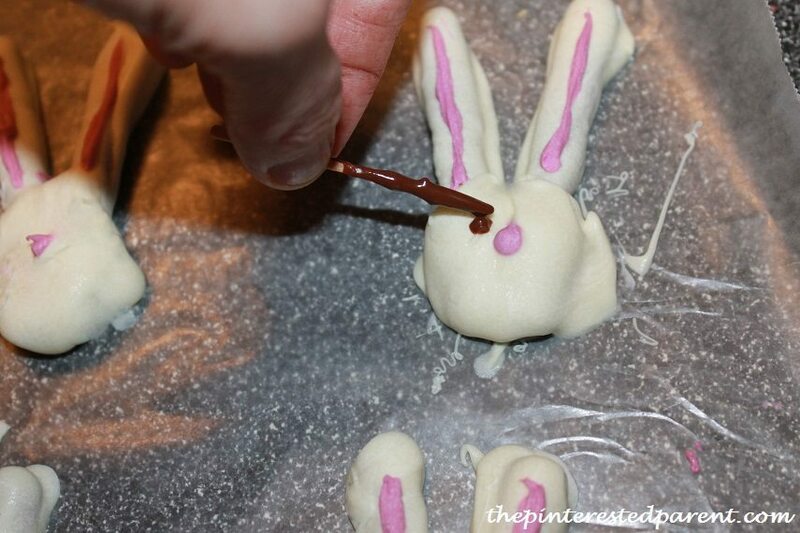 Tonight we made some sweet & salty Easter treats in the form of our favorite Easter pal. 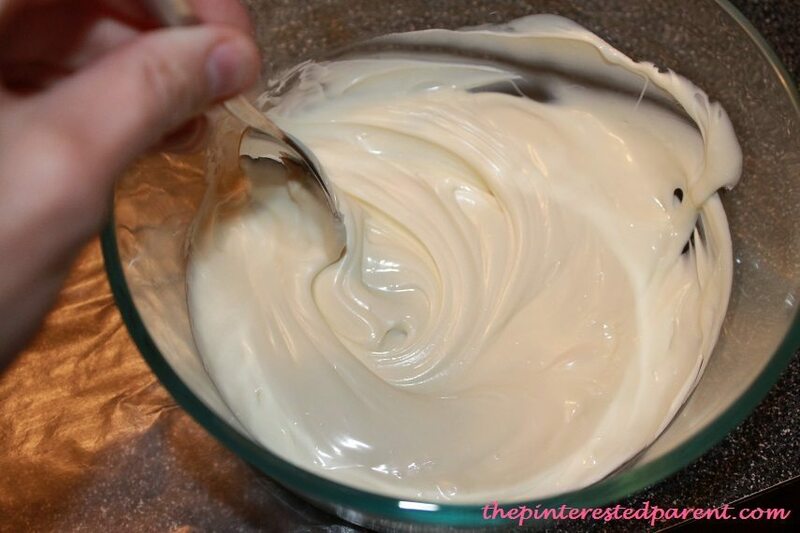 Melt white chocolate in the microwave. Put the chocolate in a microwave safe dish & heat for a minute. Check it & microwave in 30 second intervals, checking to see if it is melted before each interval. Be careful not to burn. When the chips are soft & shiny stir with a spoon. 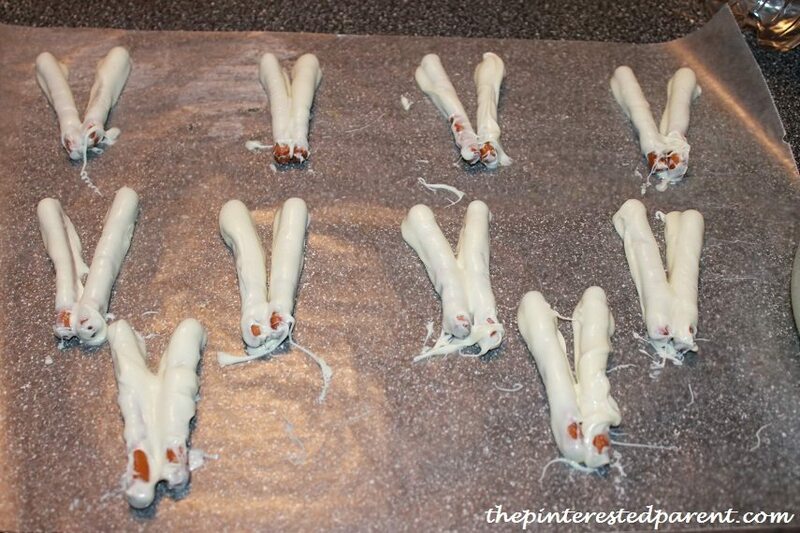 Dip pretzel dipper sized rods into the melted chocolate & lay out on wax paper. Lay two dipped pretzels side by side to form a V shape. With a spoon, spoon out a dollop of chocolate over the bottom in the shape of a circle. Be careful to not dribble chocolate over the top. It works best when the chocolate is smooth. Use a rubber spatula to smooth out any rough edges while chocolate is still hot. 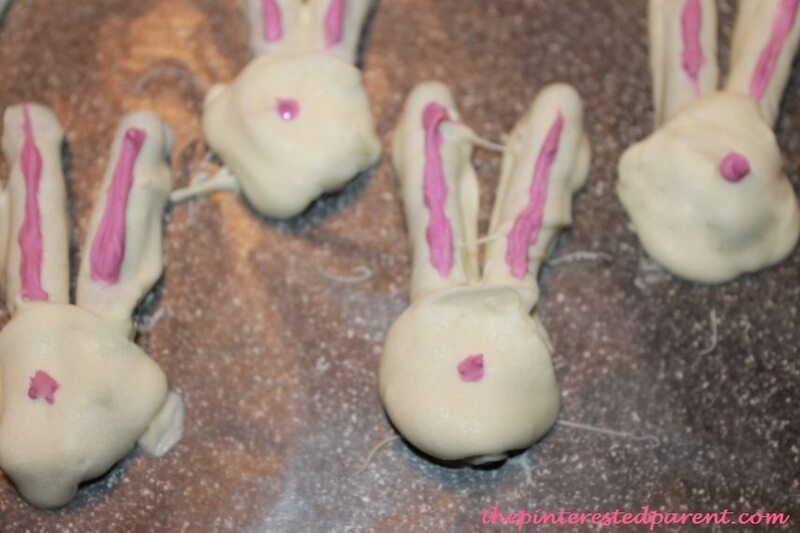 Melt pink chocolate or in a pinch use white chocolate with just a touch of food coloring gel. Using a toothpick draw a line for the inside of the ears & add a dot for the nose. 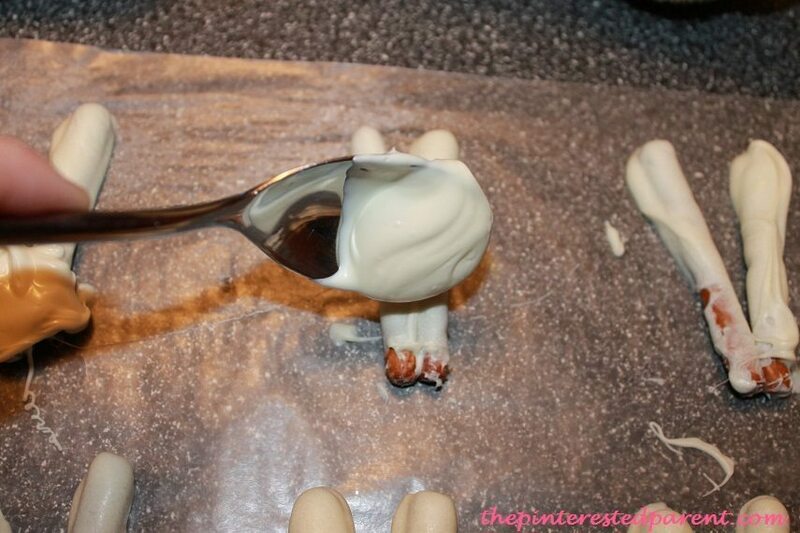 Melt a small dish of milk or dark chocolate & add in eyes, mouth & whiskers. 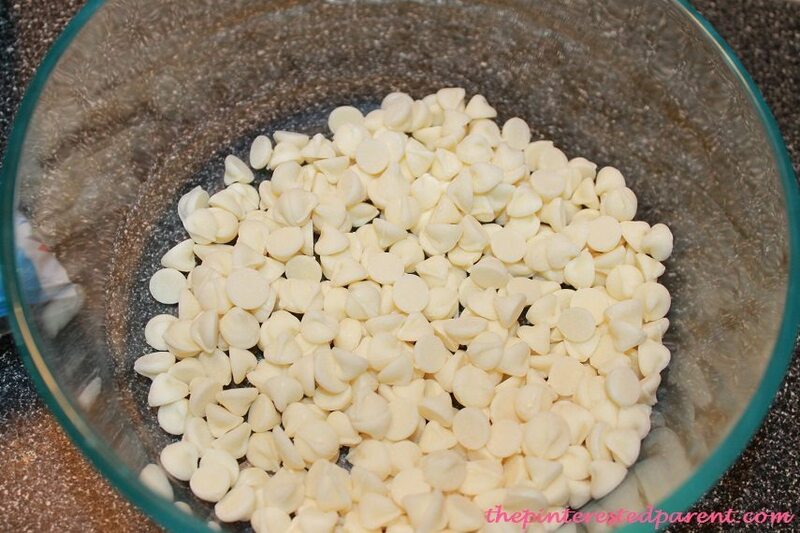 Let your chocolate cool & remove from the wax paper. If you have any imperfections, which I had a plenty, scrape the hardened chocolate with a knife to smooth out. Now let’s hop on over to our main event. Welcome to week 13 of our Sunday’s Best Link-Up. 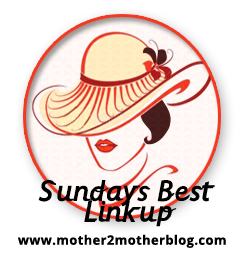 Welcome to Week 13 of Mother 2 Mother’s Sunday’s Best Linkup. This is the last week for our Spring Forward theme. We will be starting our April Showers theme next week. We will be looking for indoor activities, recipes, crafts, gardening and blogging tips for those rainy days. 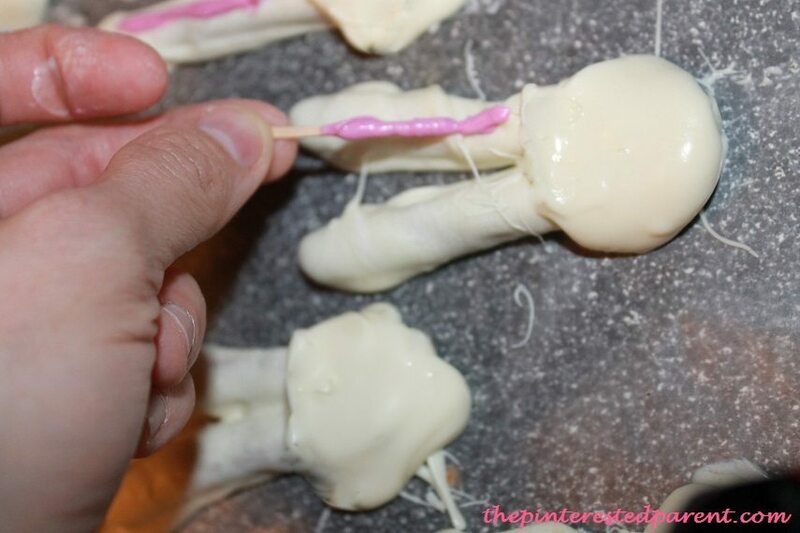 This week we’re celebrating the thaw across the country, so linkup Easter posts, crafts, recipes, gardening, decorating ideas, room makeovers, Easter tablescapes, spring cleaning and organizational tips. Blow the dust off your old posts and link those too. Don’t have posts that fit into the theme, link up whatever post you would like to share. We would love to have SEO, blogging, and parenting tips, DIY projects, homesteading, homeschooling, and your posts on life. Your linkups and giveaways are welcome too. Anything goes here, as long as it’s family friendly and you may linkup as many as you would like. Please help us grow by placing the Sunday’s Best button above on your sidebar or in your Link Party lists/directory. I appreciate your help in promoting the linkup with Re-tweets and shares. If you are selected as a Featured Blogger, let your readers and followers know that you were featured on Sunday’s Best. Now lets party! All of the posts were great, and I appreciate each of you linking up. I would like to invite all of you back to linkup your post(s) again, it could be selected this week. While you’re here take a minute to visit these great blogs. It’s a great way to meet and connect with new bloggers. Be sure to PIN or share any posts that you like, we all appreciate a little love. Thanks for linking up Janine. The pretzels were yummy. Those bunnies are so cute! Thanks for link ups! Thank you for joining us at the #SmallVictoriesSundayLinkup! Thanks so much for the feature! I’m a salty, but I love sweet and salty mixed together too 🙂 Thanks again for the fun party. Hope you can join us tomorrow on Merry Monday at 6pm PST. Those look so yummy! Two of my favourite things: pretzels and chocolate. I’ll be sure to give it a try myself! Awww! that looks so cute and I bet very delicious too. Those are so cute and look fairly easy to do! Thanks for sharing! So simple and they turned out so cute! 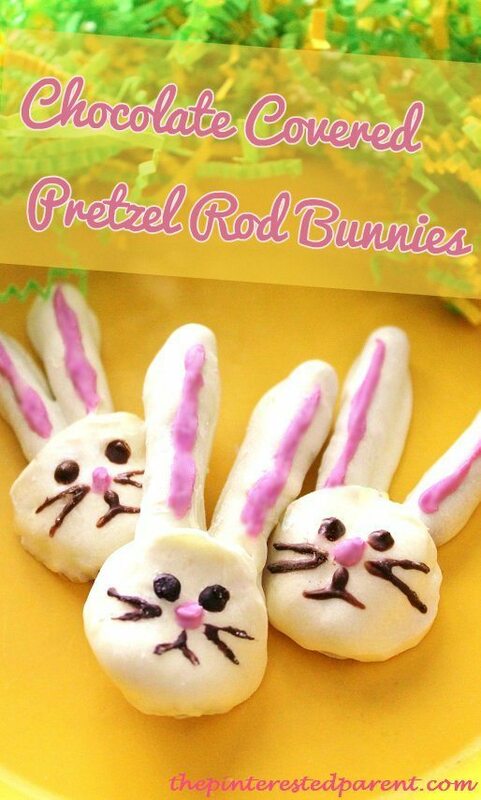 Awesome idea, will definitely have to make these for Easter. Thanks for sharing!! What a cute idea! My kids would LOVE those. Looks yummy! Love new dessert ideas. Especially ones for the holiday! Visiting from Mommy Monday Blog Hop! Oh I like sweet and salty mixed together too! Your bunnys look so gosh darned cute, I bet that taste soooo good! Those are so great! I never make sweets like that but I feel inspired now. Those are some cool ideas. Love the pretzel treats. Yum! 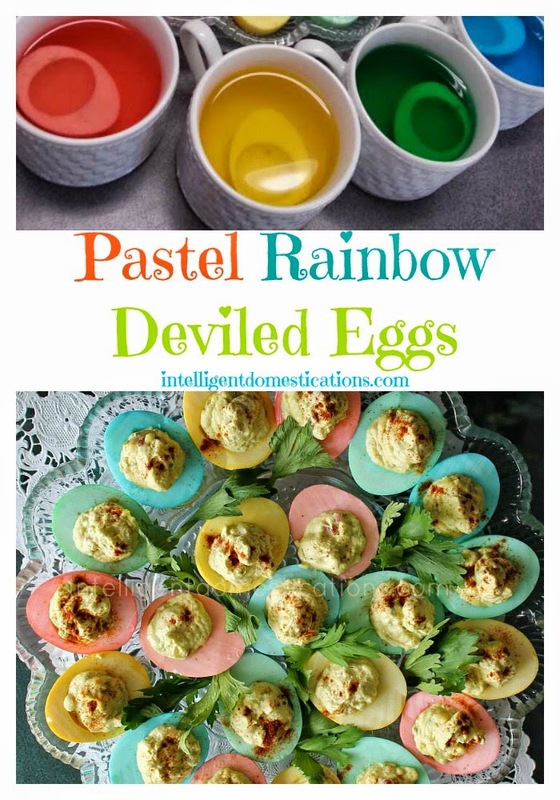 I want the chocolate bunnies and deviled eggs! 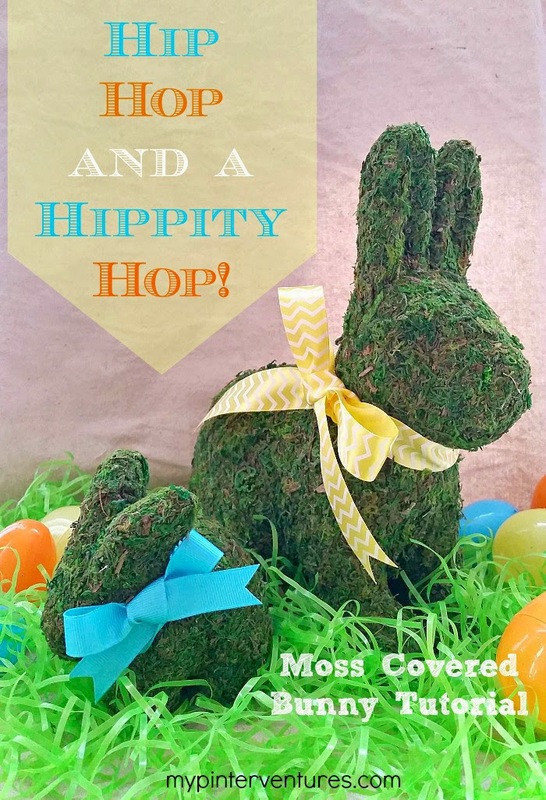 I love all the creativity shown here, and I really want to try making those bunnies! You did such a great job at making these. So creative. I am with you on loving the mix of sweet and salty. Chocolate pretzels are super delicious! These are too cute! I will have to make these with my little guy.